In August 1914, the Imperial and Royal Austro-Hungarian Army’s finest division marched out of Salzburg and Linz to confront the Russians in Poland. Through four and a half years of bitter warfare, the 3rd “Edelweiss” Mountain Division racked up an astonishing record of battlefield successes, even as the Empire it served finally crumbled around it. Edelweiss Division is a supplement for our Infantry Attacks: Fall of Empires game, featuring 88 new die-cut, mounted pieces displaying the division’s units in their own special color scheme. There are also 20 new scenarios, and with two “battle games” that link them together. 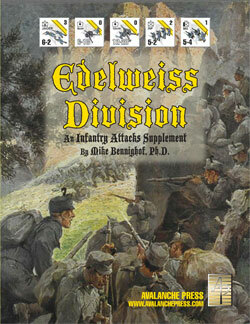 Edelweiss Division is not a complete game; everything you need to play all 20 scenarios (and the battle games) is included in the book and the boxed game Fall of Empires. No other books or games are required to play any of the scenarios.